– Green start the season with entertaining draw. – Scott chips in with brutal 62. – Tom Colbran shines with the bat with undefeated 40. Are you a former player looking to keep in touch with the game or had experience with scoring ? The seniors are looking for help with scoring and umpiring . Please let us know if you are able to help – even if its for only 1 game. A new season and some new faces in the line up for Wisborough who began life back in the invitation league with an enthralling draw at home to newly promoted Eastergate. The home track looked good thanks to the hard work put in by Albie and his helpers. Wis lost the toss and were asked to have a bat by Eastergate. Captain Self opened the batting alongside now almost veteran opener Martin Hopkins. After the initial delirium that came from Wis surviving the first ball of the season for the first time in 2 years the openers settled into their work. Hopkins was positive from the off whilst Self looked to use his body more than his bat to repel the Eastergate bowlers. The scored had moved nicely to 36 when Hoppo got underneath one and skied a catch to point. This brought in Napper for his first innings in 2 years. He was off the mark with the first ball he faced and soon looked like he’d never been away. 66 runs were added for 2nd wicket and the score had just gone past 100 when Self was out caught in the deep. This brought the big hitting Matt Scott to the crease. After a steady start he soon got going and he and Napper put on 101 together. As the overs began to run out Scott looked to up the rate further but in doing was caught at deep mid wicket for a brisk 62. Napper continued to bat well supported by Chris Francis but he was eventually dismissed for a brilliant 80. Jonny Farmer was promoted up the order to provide some late hitting but instead tickled the ball around the corner straight to square leg first ball. Francis got the last ball of the innings to the boundary and Greenfinished on a confidence building 235 for 5. So after the usual fine tea supplied by The Cricketers Arms it was up to the homes side to take 10 wickets to win the game. Rainford and Thatcher opened the bowling and Rainford struck in his 2nd over. A good catch at square leg from Chris Francis. However the 2 openers were perhaps suffering from early season rust and were going for too many runs as Eastergate made a confident start. The introduction up the hill of Jonny Farmer proved to be a turning point as he got the crucial wicket of the Eastergate no. 3. The skipper brought himself on with his little cutters down the hill. The plan was to take pace off the ball and the plan soon began to work as Self began to take wickets at regular intervals and would end up the pick of the bowlers with 4 for 39. The big thing for the visitors though was that their captain was still at the crease and was determined not to give away his wicket. Green were making inroads at the other end though and Thatcher returned from the pavilion end to take 3 quick wickets. With 4 overs to go Eastergate were 9 down and the home side were doing everything possible to take the last wicket. The visitors no. 11 though showed excellent technique and maturity to block out the remaining overs alongside his skipper to get the draw for his team. A positive start for the home side who will be encouraged by top order runs and taking 9 wickets on a track not offering a lot to the bowlers. An 18 point start is not too bad and certainly something to build on. A mention for Jack Carter who kept very well in his first appearance for the club. Well done to Eastergate who battled hard to secure the draw. It was refreshing to play a game in a good spirit with a lack of arrogance or egos on either side. Wisborough Green 2nd X1 V Eastergate 2nd X1. On a beautiful Sussex spring day, we travelled to Eastergate for the first match of the season. We welcomed a few new faces and enjoyed the company of a few old ones. The format for the match is 40 overs per team and a win/lose format, which is welcomed by the majority. Eastergate won the toss and elected to bat. It was not long before the pace of Joel Colbran and the flight and guile of John Pleasants had the Eastergate openers in trouble. Pleasants bowled his 9 overs right through, to avoid a 2nd spell warm up, which may have lasted a while. John finished a great tidy spell, of 9 overs 0 for 34. Joel bowled with pace and accuracy finishing 7 overs for 22 runs and getting one of the openers out, caught well by Tim McMath who kept exceptionally well for a man just over 40. Doug Cox bowled his left arm spin well through his 9 overs finishing on 1 for 46, and Richard Brooks, bowled brilliantly, not having played the game for 10 years, rattled through 5 overs getting 1 for 19. Rhys Stonely also bowled and struggled a bit for line, but is a great chap and look forward to him playing again. The star of the bowling was Tom Colbran, with his cheeky smile and assassin like glaze, bamboozled the opposition batsmen and his 4 overs claimed 3 for 18. Tim McMath played his part in the dismissals and stumped 3 victims off Toms bowling. Eastergate finished on 206 for 6, a few more than they should have got, but Wisborough walked off with a cheeky grin, as the pitch was excellent the outfield quick. The Wisborough reply was solid with ‘Silky’ Steve Caldersmith and Gary ‘class bat’ Harwin both playing shots all around the wicket, and looking as though they could knock off the runs with ease. Gary was adjudged LBW for 11, with a nasty full ball on his toe. That bought Joel Colbran to the wicket and although looked good came and went quickly. Doug Cox followed up his tidy bowling with a solid batting display, holding up one end whilst ‘Silky’ stroked the ball to all parts. Doug was bowled for a fine 10, so in came the star bowler Tom Colbran, batting slightly earlier than he should do, due to a Saturday night date with Cameron Diaz. Tom was in no mood for hanging about and hit 5 in a few deliveries and was then caught going for a big smash. That bought Sadler to the crease who struggled to see it at first, but then managed to get eyes, feet and bat working around the same time and moved the score on. A few boundaries helped the cause and Wisborough were on a roll. During this time Caldersmith was still there, but suffering from cramp, and collapsed in agony before having to be retired hurt. The star keeper Tim McMath came and went for a quick 3, but in came Kenny Vickery who swished the ball straight over the bowlers head, and joined Sadler in a fine partnership to win the match. Sadler finishing on 57 not out and a great win was had by the 2nd Team. It was great to welcome Gary, Rhys, Doug and Richard to the club all of which are good players and look forward to many more matches with you. 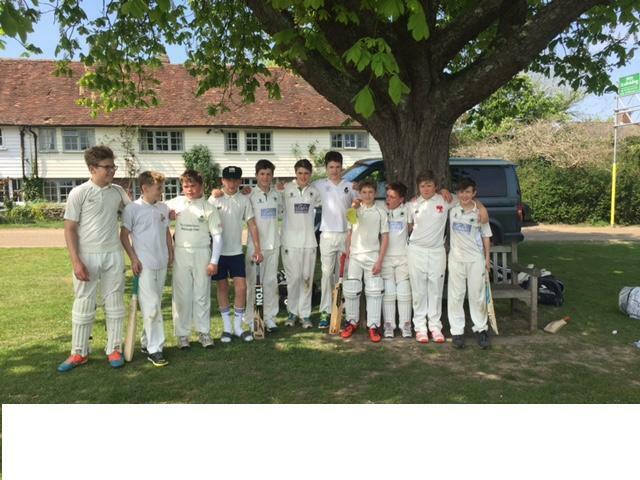 In baking sunshine, there are few finer ways to start the weekend than Saturday morning cricket on the Green, as Wisborough Green Under 14s kicked off their 2016 season with a home match against Southwater. Southwater won the toss and elected to bat first . Some tight bowling in the opening overs from Hugo and Leon saw the scoreboard tick over slowly, barely touching three an over as Southwater prodded away cautiously, protecting their wickets whilst posing scant trouble to the scorers. The early overs out of the way, bowling changes brought some swift action as a couple of quick wickets fell, and the opposition were floundering at 30-2. But early prudence began to prove the better part of valour as the innings moved into its second half, and the run rate finally began to nudge upwards, up past four an over as Southwater’s key players built a strong partnership. As the rate hit five an over, and with Southwater at 80-2 off 16 overs, the forced retirement of one of the batsman as he reached 40 caused further stuttering of runs, just as the final acceleration over the final overs was due, and with his fellow high scorer then being skittled for 37 just before retiring, the 20 overs limped to a conclusion with Southwater reaching 110-3. An imposing target, but not unassailable. Refreshed after drinks and cakes, Southwater took to the field, Hugo and Callum P stepping up to the wicket to face the openers. Some tight spin bowling kept the run rate in check over the early overs, and when Hugo fell for just 5 runs a degree of nervousness may have crept in. But, now joined at the crease by Tom, Callum kept the rate ticking over before Tom took over with some hefty boundaries, and the middle of the innings raced by with the run rate consistently around five, well on course for a comfortable victory. As the score entered the 90s, Tom was also forced to retire following a fine 40, but Callum continued his excellently paced innings to keep the rate of track. A quick 12 from Leon before he was caught behind brought Luke to the crease and, scoring off every ball faced he saw the match over the line at the end of the 19th over for an eight wicket victory. It was a fine performance to begin the season, with all the boys playing their part. Some tight bowling kept the opposition batting under control, and some well-paced batting meant that the target was easily reached without any risks needing to be taken by the batsman. Sturdier challenges will surely follow, but there are fewer better ways to kick-off than with a comfortable victory!